Had it not been for the approval of a shaman, who just happened to be doing a cleansing of the artists’ studio that day, we might have never been able to bring you the exquisite jewelry of the Cachi sisters. In their small and humble taller (the Peruvian term for studio), tucked into the busy streets of Cusco, Peru, sisters Hilda and Sonia Cachi work with quiet intensity, seemingly unaware of the hustle and bustle outside. They’re carrying out an uncompromised family tradition of making some of Peru’s finest silver jewelry. At the recommendation of a dear friend, I went to visit Hilda and Sonia, who are famously reclusive, working only with buyers and clients that meet their standards-standards known only to them. With great hope and excitement, I trekked to their unassuming space and thanks to that shaman who advised Hilda that my aura was a radiant blue, I was admitted access to their magical world. Hilda and Sonia are just two of Gregorio Cachi’s five daughters, all of whom are metal-smiths. 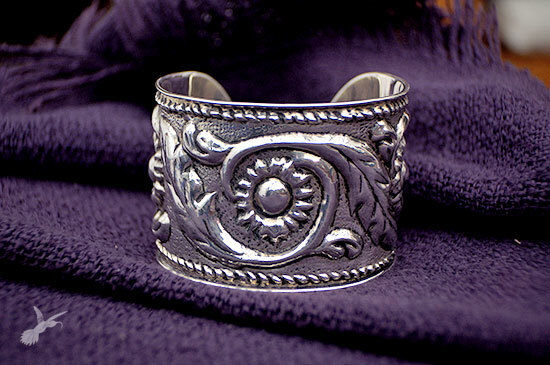 Continuing in the footsteps of their award-winning father, the sisters practice time-honored and highly laborious techniques to make silver jewelry that is so highly crafted that their clients travel from all of the world-Mexico, Ecuador, Argentina-to view and purchase their work. Hilda’s work tends to be more Pre-Columbia and rustic, while Sonja’s work can be identified by contemporary variations on traditional designs. Sitting on wooden benches, amidst a clutter of hammers and other tools, they work tirelessly at every detail. They pour silver into antique molds and through careful hammering and refining, create one-of-a-kind colonial pieces that are of such quality and detail that associations, such as UNESCO, seek them out. 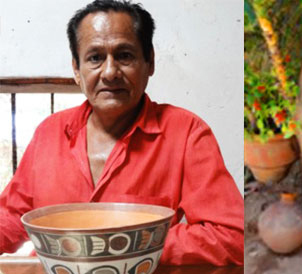 Hilda has been honored with awards from UNESCO and the Peruvian government as has her father. At El Pequeno Colibri, we are dedicated to honoring artists whose work honors Peruvian heritage and culture. And so I am delighted (and grateful!) to be able to present you with the work of Hilda and Sonia Cachi.